Please join the MAC for a night out at the movies!!! Then join us for a drink after! Protected content nominated "If Beale Street Could Talk" is a Protected content romantic drama film directed and written by Academy Award winner Barry Jenkins,(Academy Award director & writer winner of "Moonlight") is based on the great American novelist, playwright, civil rights activist and social critic James Baldwin's novel of the same name. 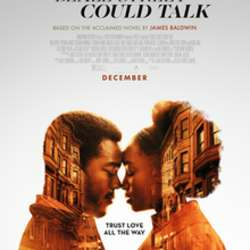 It stars KiKi Layne, Stephan James, Colman Domingo, Teyonah Parris, Michael Beach, Dave Franco, Diego Luna, Pedro Pascal, Ed Skrein, Brian Tyree Henry and Golden Globe Award winner Regina King . It follows a young African-American woman who, with her family's support, seeks to clear the name of her wrongly charged lover and prove his innocence before the birth of their child. We’ll meet outside the theater 15mins before showtime to make sure everyones arrived . The movie actually starts at 20:30h. Get your tickets in advance to be sure to get a seat. DO NOT wait for the last minute as it may be sold out.